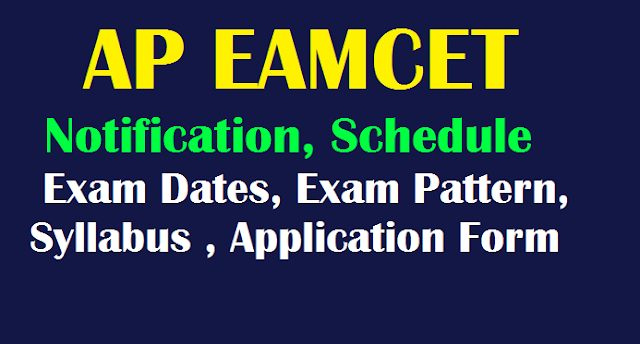 AP EAMCET 2019 Notification, Application Form, Exam Dates, Exam Pattern, Syllabus sche.ap.gov.in/eamcet AP EAMCET 2019 Notification has been released. It will be conducted by the Jawaharlal Nehru Technological University, Kakinada on behalf of APSCHE. EAMCET is a state level examination. It is organized to offer admission in various professional courses offered in University/ Private Colleges in the state of Andhra Pradesh. JNTU Kakinada has published the AP EAMCET 2019 notification and it is being conducted on behalf of APSCHE. Applications are invited form eligible students for entry into the first year of the following courses offered for the academic year 2019-2020 in the state of Adhra Pradesh. Get complete information about AP EAMCET 2019 Notification, Schedule, Apply Online on https://sche.ap.gov.in/eamcet . AP EAMCET 2019 Notification has been released by Jawaharlal Nehru Technological University, Kakinada (JNTUK) for entry into the first year of the Engineering, Agriculture Under Graduate Professional courses offered for the academic year 2019-2020 in the University & Private unaided and affiliated Professional colleges in the State of Andhra Pradesh in favour of The Andhra Pradesh State Council of Higher Education. .
AP EAMCET 2019 Exam Date has been released. The application form is releasing from 26th February 2019. 23rd & 24th April 2019 (Agriculture). 1. Engineering, Bio-Technology, B.Tech (Dairy Technology), B.Tech (Agriculture Engineering), B.Tech (Food Science and Technology). 2. B.Sc (Agriculture)/B.Sc. (Horticulture)/B.V.Sc & A.H/B.F.Sc. In the case of Engineering, Pharmacy courses, candidates should have completed 16 years of age as on 31st December of the year of admission (2019). There is no upper age limit. In the case of B.Tech. (Dairy Technology), B.Tech. (Ag. Engineering), B.Tech. (FS & T) and B.Sc. (Agr. Engg), candidates should have completed 17 years of age as on 31st December of the year of admission (2019) and an upper age limit of 22 years for all the candidates and 25 years in respect of Scheduled Caste and Scheduled Tribe candidates as on 31st December of the year of Admissions (2019). (Engineering Agriculture & Medical Common Entrance Test conducted by JNTU Kakinada on behalf of APSCHE), Office - Administrative Building, Ground Floor, Jawaharlal Nehru Technological University Kakinada, Kakinada-533003 (Andhra Pradesh), Phone No. : +91-884-2340535, 2356255, Website https://sche.ap.gov.in Online ap eamcet 2019, online ap eamcet 2019 application, ap eamcet 2019 dates, ap eamcet 2019 details, ap eamcet 2019 eligiblity creteria, ap eamcet 2019 exam date, ap eamcet 2019 exam form, ap eamcet 2019 fee, ap eamcet 2019 important dates, ap eamcet 2019 notification, ap eamcet 2019 question papers, ap eamcet 2019 syllabus, ap eamcet web https://sche.ap.gov.in/APSCHEHome.aspx The detailed information regarding eligibility, age, syllabi, related instructions and procedure for online application are available in the website.